For thousands of years Ruby has been considered as one of the most valuable gemstones on Earth. It has got all it takes for a precious stone: a wonderful color, excellent hardness and an overwhelming brilliance. Besides, it is an extremely rare gemstone, especially in the finer qualities. The most important characteristic about this valuable stone is its color. There is of course a reason for this: the name "Ruby” was derived from the Latin word "rubens” meaning "red”. The red of Rubies is in a class all by itself: warm and fiery. Two magical elements are associated with the symbolism of this color: fire and blood, implying warmth and life for mankind. And thus Ruby-red is not just any old color, no, it is the epitome of color: hot, passionate and powerful color. Like no other gemstone Ruby is the perfect symbol of powerful feelings. A ring set with a precious Ruby does not really symbolize a calm and moderate sympathy, but rather passionate and unbridled love which two people feel for each other. Lab Created and Lab Grown and Synthetic are synonymous terms. To use any of these terms, according to the Federal Trade Commission, the gemstone must have essentially the same appearance and optical, physical, and chemical properties as the natural material that they represent . 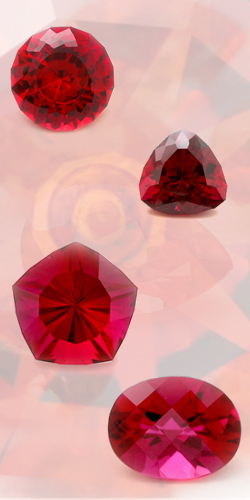 To inquire about pricing, shipping rates or any other information you need about Lab Created Rubies please email us at sales@andegem.com .